Christopher Wray tells a House committee that he is proud of the agents, analysts and other personnel who he said were working to protect Americans. Wray, who served as a top Justice Department official under President George W. Bush and was nominated as FBI director by Trump, has faced Republican criticism over perceived political bias in special counsel Robert Mueller’s probe of possible Trump campaign ties to Russia during the 2016 presidential election and in the handling a year earlier of an FBI investigation into Hillary Clinton’s use of a private email server that ended without criminal charges. The emphasis on the Clinton and Trump probes reflected how the FBI in the last two years has found itself entangled in American politics, with investigations focused on the Democratic presidential nominee and the Republican president and his successful campaign. Those investigations have transformed routine oversight hearings, like the one Thursday, into platforms for tense questions about the political leanings of an agency that prides itself on being removed from partisan consideration. Wray’s defense of the FBI came after the committee’s chairman, Rep. Bob Goodlatte, R-Va., said he was concerned by reports that Peter Strzok, a veteran counterintelligence agent involved in the Clinton investigation, was removed from Mueller’s team last summer following the discovery of text messages seen as potentially anti-Trump. “Even the appearance of impropriety will devastate the FBI’s reputation,” Goodlatte said. Rep. Jerrold Nadler of New York, top Democrat on the House judiciary panel, predicted Trump’s attacks on the FBI will only grow louder as Mueller continues investigating. “Your responsibility is not only to defend the bureau but to push back against the president when he is so clearly wrong, both on the facts and as a matter of principle,” Nadler told Wray. Wray’s tenure as the new FBI chief would be difficult even without the intense scrutiny of the Russia investigation. Since he was sworn in on Aug. 2, the U.S. has experienced two of the deadliest shootings in its modern history and an attack on a bike path in Manhattan that officials have said was terrorism. Trump’s weekend tweets created a fresh dilemma for Wray. With his bosses, Attorney General Jeff Sessions and Sessions’ deputy, Rod Rosenstein, staying publicly silent, it fell to Wray to defend the agency. But FBI directors traditionally have been low-key and stoic – with Wray’s predecessor, James Comey, a notable exception. And Trump’s firing of Comey while he led the Russia probe shows what can happen to a director who antagonizes the president. 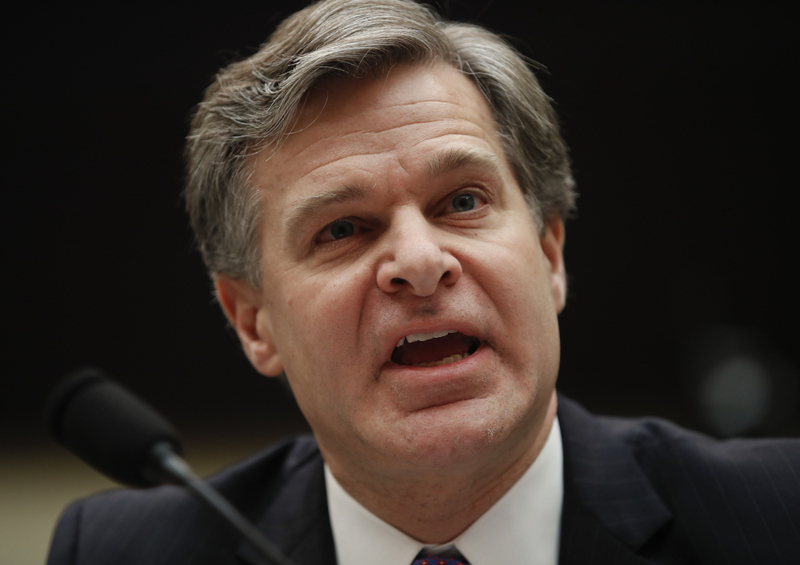 Wray repeatedly deflected questions about the FBI’s handling of the Clinton investigation, saying the entire matter was under review by the Justice Department’s inspector general. Republicans repeatedly pressed him on reports that Strzok tweaked the language of the FBI’s finding from “grossly negligent” – the standard laid out in the relevant statute – to “extremely careless,” which was the language that Comey ultimately used in discussing the Clinton case with the public.